I believe that it is important for people to realize that all plants, trees, animals and humans have a physical and spiritual connection. When these connections are disturbed, chaos can ensue. But when these systems work in harmony, life is produced and sustained. The purpose of this article is to hopefully shift the common paradigm that the space under a fruit tree should be kept clean, and plant free. A common belief is that very little will survive under a tree, this couldn’t be farther from the truth. Many plants will not only grow under a tree, but will also benefit the tree for years to come. 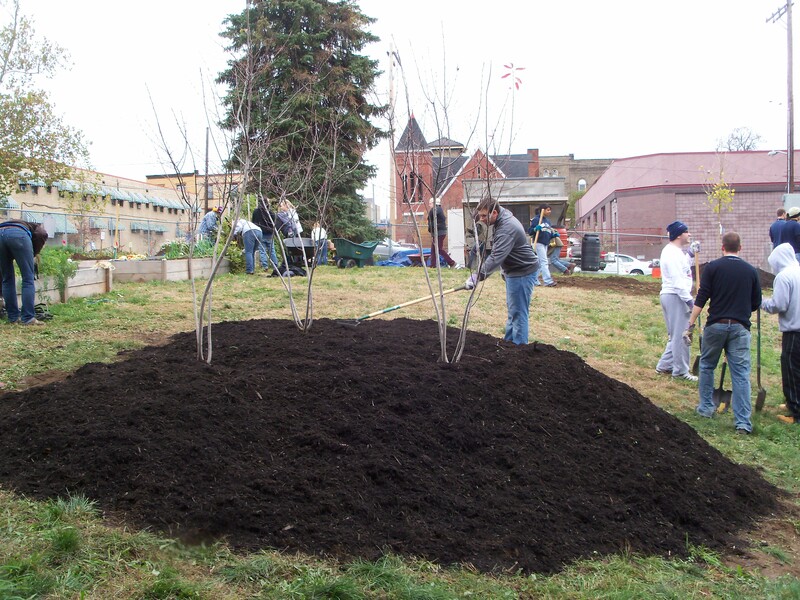 Use the cardboard sheet-mulch somewhere else – I am constantly blown away by the fact, that anybody out their thinks it is a good idea to cover the ground under a tree in cardboard. Yet everyone does it… Cardboard, when used as a sheet mulch, takes a long time to break down. As long as that mulch is in tact, the amount of water required to penetrate it will be considerably multiplied… Excessive mulch under a tree will kill the tree… Don’t be fooled!.. 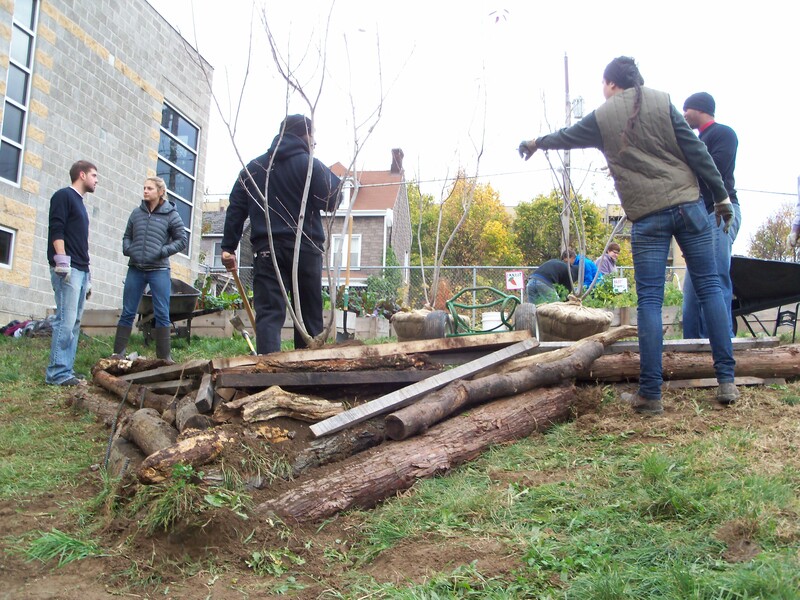 Last fall I had the chance to help GrowPGH plant some fruit trees at Miss Mary’s Garden in Homewood, hugelkultur style. Never cover the base of the tree with mulch – I know you have all seen it when driving through the suburbs, trees mulched well above the base of the trunk. This is commonly referred to as a “mulch volcano”, this is the absolute worst thing you can do to a tree… Often this can be a death sentence for an otherwise healthy tree. Daffodils – Daffodils are one of my all time favorite fruit tree companion plants, they begin to bloom right before most fruit trees. Since these bulbs bloom before the trees, the early season pollen seekers will already be in the area of the tree when it blooms. Daffodils have come a long way from the past, they are affordable, and readily available in so many styles it will make your head spin. Plant them 6 inches away from the trunk, in a circle around the tree… You will not be disappointed. Chives – Includes all Allium, but this is specifically about chives. Chives are the smallest species of all the edible onions, they can become problematic if left to their own devices though. Chives are a perennial plant native to North America, and is one of the most commonly used herbs today. Chives are absolutely repulsive to insects, yet their flowers are extremely attractive to beneficial pollinating insects. Historically, farmers would plant chives at the edge of their gardens to repel insects. The juice, when extracted, can be used as a spot insecticide. Bee Balm – I love bee balm, it is an aromatic herb in the family Lamiaceae. It is a very hardy perennial native to eastern North America in the mint family, plants in the mint family have square stems, and opposite leaves. Bee balm tends to grow in dense clusters and can get very tall, I personally recommend getting dwarf versions of this plant… Especially in urban environments. Bee Balm is used to attract beneficial, but it is also top-notch as an ornamental. Dill – Depending on where dill is grown it is either annual, or perennial… Though in my climate it is an annual. Dill is used as a tree companion due to the amount of beneficial insects it attracts. Echinacea – One of my all time favorite plants, I currently grow 15 varieties on my tiny urban lot. Echinacea is a herbaceous flowering plant in the daisy family, Asteraceae. 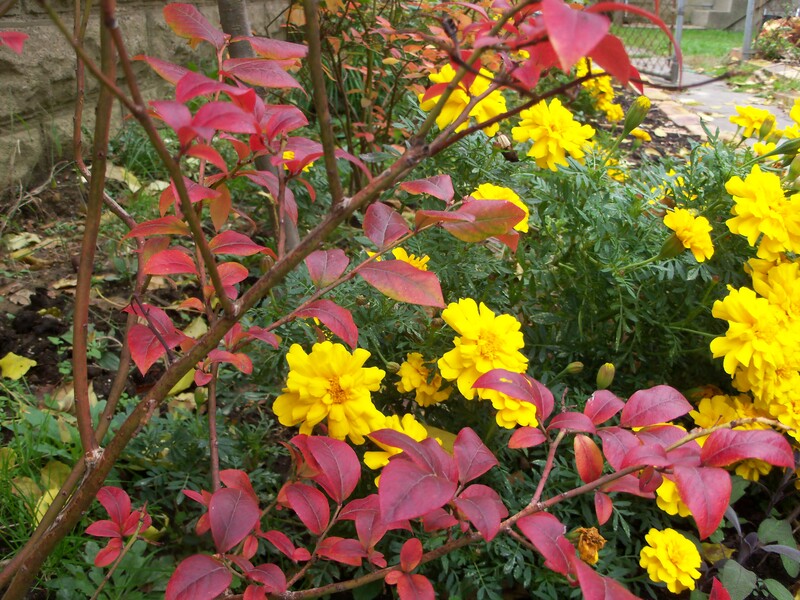 It is an extremely drought tolerant plant, which makes it perfectly suited to being planted under a dense tree. The plant grows from a tap-root, because of this it has access to deep water reserves and has the ability to make nutrients available to the tree that would not otherwise have been available. Cone flowers are now available in hundreds of colors, sizes and styles, they make a great addition to any garden attracting beneficial insects all season long. Lupin – Lupin is a genus in the Legume family, it is a herbaceous perennial plant with a few annual variations. It is commonly used as a cash crop alternative to soy, it is a beautiful plant when flowering. Lupin can fix nitrogen from the air into ammonia via Rhizobium root nodule symbiosis, fertilizing the soil for the tree. One of the primary ingredients recommended for fruit trees is nitrogen, in the long run, legumes could ultimately save you time and money in fertilizer application. Lupines are also a favorite food for several species of lepidoptera..
New Jersey Tea – A little less common, but rather beneficial shrub that is native to North America. NJT was named during the revolution because its leaves were used as a substitute for tea. The plants roots can grow very deep and large, this is a survival tactic developed to help it survive wild fires. It twigs are a favorite of browsing winter deer, and its flowers attract many species of lepidoptera. That is obviously not the end all list of Permaculture guild plants, but it is a good list to start your research with. Remember any plant with a flower has potential to be used in a guild, chamomile, marigolds, clover, peas, beans, viola, vetch, salvias, yarrow, mint, onions, garlic, strawberry, hostas, ferns, foxglove, rose, clematis, monkshood, forget-me-nots, feverfew, oregano, even asparagus just to name a few. I guess what I am trying to say is be creative, think of the space underneath your yielding trees as valuable garden space waiting to be productive. This entry was posted in Art, Gardening, Guerilla Gardening, Permaculture, Practical Urban Permaculture, Trees and tagged beneficials, fruit, fruit tree, fruit tree guild, garden, guild, native plants, nature, permaculture, pesticide, pollinators, tree. Great post! I have been thinking about planting under our fruit trees but wasn’t sure if it was the right thing to do. Like you said, have to research and find the right plants. Thanks! call out to lxax, yes it takes planning! but bush fruit do really well, redcurrants and rhubarb are a lovely combination in pies/ preserves/ wine and very suited to the weather 😉 contact me at my blog if you fancy chatting companion planting in the british climate? Keep up the information. This is helpful. I’m planting a North Star cherry tree this spring. Thanks for sharing – really helpful! I’m excited about moving to the English countryside (soon hopefully) so I can have my own garden but now have to research how to deal with the amount of rainfall / fewer sunny days they have here. I have noticed that if there is a niche nature likes to fill it with something. Great post.